Do you fancy a bear? When asked next time “Do you fancy a bear?” instead of “Do you fancy a beer?”, the new Tea-Bears by Kalfany Süße Werbung could be the reason. The shape of the novelty that the company produces itself in compliance with the IFS standard is similar to the classic jelly baby bear, but instead of devouring it one drinks it: When hot water is poured over one or two bears the outcome is a tea-like hot drink that can be enjoyed at home or in the office, during a meeting or at the exhibition stand. The novel application is guaranteed to attract the attention of the target group. 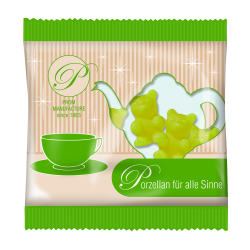 The colourful bears are available in 18 g promotional sachets in the flavours peppermint, cinnamon/orange or ginger/lemon for minimum order volumes of 5,000 pieces. The promotional sachet that is optionally made of conventional or compostable foil can be imprinted in up to 4 colours, a matt film lamination is also possible. On request larger volumes can also be realised (i.e. 100 g in a stand-up pouch). And if there is no hot water handy, the patented Tea-Bears can simply be eaten. The beary strong messengers were distinguished with a Promotional Gift Award 2017 in the category Give-aways for the creative customer address with a ‘aha’ effect.